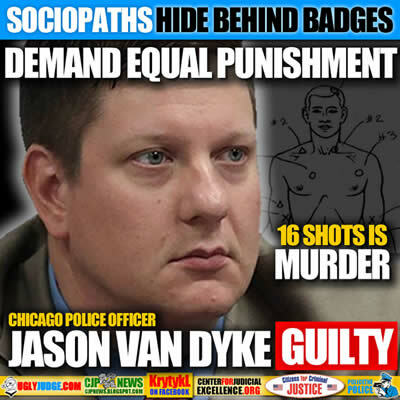 Officer Jason Van Dyke is a perfect example of the problem person that easily gets hired and then hides behind a fancy uniform and shinny tin Badge. Police Unions have striped citizens of their rights by giving police too much protection to the point they can kill without any accountability. The fact the incident was recordered on video helped prosecute officer Jason Van Dyke who perjured his report and statements when looking at murder charges. This happens every time police kill someone, they’re not treated the way the public is. Worse they’re given a chance to create a story and change the facts to fit their warped reality. The entire Police Officer’s Bill of Right’s and Police Unions are designed to help dishonest Police escape prosecutuon or accountability. It’s time the tax payer stops being extorted out of billions of dollars in legal fees, pensions, paid vacations after they kill and victim pay outs. Police and their families must be held personally liable. NO MORE IMMUNITY WHEN THEY COMMIT A CRIME, ANY CRIME. Law enforcement officers, except when on duty or acting in an official capacity, have the right to engage in political activity or run for elective office. Law enforcement officers shall, if disciplinary action is expected, be notified of the investigation, the nature of the alleged violation, and be notified of the outcome of the investigation and the recommendations made to superiors by the investigators. Questioning of the law enforcement officer should take place at the offices of those conducting the investigation or at the place where the officer reports to work, unless the officer consents to another location. Law enforcement officers will be questioned by a single investigator, and he or she shall be informed of the name, rank, and command of the officer conducting the investigation. Law enforcement officers cannot be threatened, harassed, or promised rewards to induce the answering of any question. Law enforcement officers are entitled to a hearing, with notification in advance of the date, access to transcripts, and other relevant documents and evidence generated by the hearing and to representation by counsel or another non-attorney representative at the hearing. Law enforcement officers shall have the opportunity to comment in writing on any adverse materials placed in his or her personnel file. Law enforcement officers cannot be subject to retaliation for the exercise of these or any other rights under Federal, or State. Police Unions Defend Bad Cops Who Do Awful Things. Why Won’t They Defend Broward County Deputy? A “Death Spiral” for Police Unions? Do strong police unions make it more difficult to stop bad cops? Did you know police have their own Bill of Rights? The three men were charged with conspiracy, misconduct and obstruction of justice for filing false reports in Van Dyke’s case, but the newly unsealed document points to numerous other unnamed officers who were at the scene or involved in the ensuing investigation of the shooting who allegedly worked to protect Van Dyke. Questioning of a law enforcement officer should be conducted for a reasonable length of time and preferably while the officer is on duty unless exigent circumstances apply.